Pictured L-R: Fully Managed COO, Marty Hasselbach; Vancouver Mayor, Gregor Robertson; Fully Managed CEO, Joel Abramson. 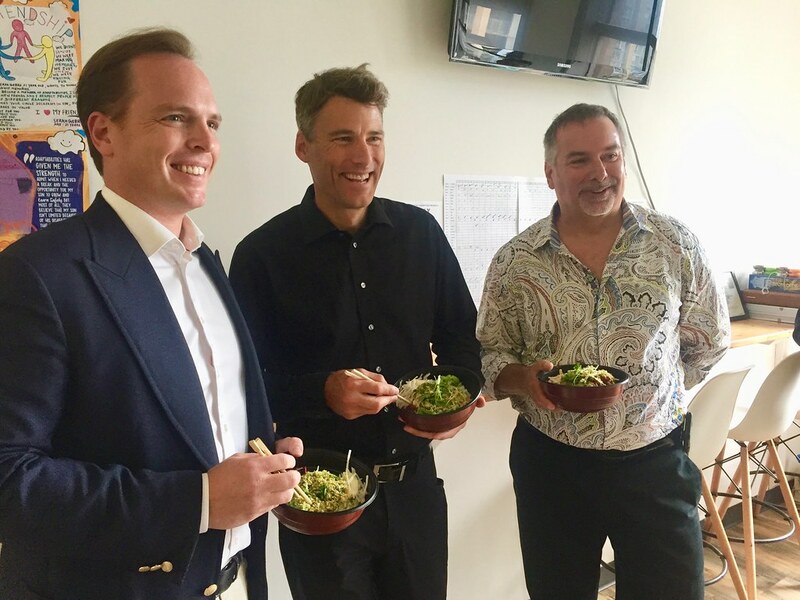 On Friday, July 21st, Fully Managed was honoured to host Mayor Gregor Robertson, who has served as Mayor of Vancouver since his election to office in 2008. As part of an initiative to learn more about tech companies in Vancouver, Mayor Robertson has toured throughout Vancouver, getting to know the vibrant and diverse teams that help the tech industry thrive. To cater the lunchtime visit, we invited Pacific Poke, a local favorite of the Fully Managed team, to set up shop in our kitchen with a 'build your own' poke bar. We love to support local companies, and having the opportunity to share on of our favourite local restaurants with the Mayor was an added bonus. Following lunch, and a quick tour of the office, Mayor Robertson sat down for a Q&A with the Fully Managed team. Covering topics from housing and pet-friendly rentals to innovation and Vancouver's emergence as a world-class tech cluster, the Mayor entertained a number of questions and provided valuable insights into Vancouver's future. The experience was capped off by a lively ping pong challenge in which the Mayor showed that he is no stranger to table tennis. We would like to thank the Mayor and his team for joining us at our office and invite him back for a ping pong rematch anytime!